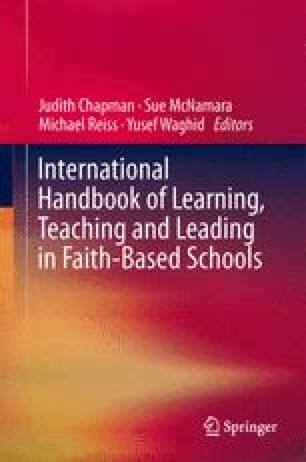 This chapter aims to contribute to an understanding and articulation of what leaders need to learn, to know, and to do, as a comprehensive evidence base for informing and shaping initiatives and strategies for the learning of leaders in faith based schools. The chapter draws on research commissioned by the Director of Catholic Education in Melbourne, Australia, to provide a rigorous, evidence base for the learning of educational leaders in the Catholic setting. It is also informed by the international OECD Activity on “Improving School Leadership” and developments in leadership and learning in various international settings. A number of guiding principles, concepts and concerns considered vital to the learning of leaders in Christian faith based schools are identified and discussed. The research which informs this chapter was undertaken with the assistance of a range of people in education in Victoria, Australia and internationally. The Catholic Education Office Melbourne funded research in 2009/10 to identify the learning needs of leaders as a basis for the development of the learning platform for the newly created Catholic Leadership Centre which began its operations in 2013. Special recognition is given to the contributions of senior officers of the Catholic Education Office, Melbourne, in particular Stephen Elder, Joe Fleming; Debra Punton and Mary Oski. We also acknowledge Maggie Farrar of the National College of School Leadership in the UK, Beatriz Pont of OECD Activity on “Improving School Leadership” and colleagues at St Edmund’s College, Cambridge University.